With respect to lumen output, Halogen Infra-Red Reflicting bulbs are the next best thing to HID bulbs. The proliferation of low-cost HIDs for under $100 has changed the value delivered for the low beams, but they remain the cheapest, easiest alternative on the market to low beams, and the bar-none best alternative for high beams. They are also genuinely effective. Many competitors use coated bulbs to alter color temperature, and then overdrive the bulb to make up for the light loss; breaking even on lumen output at best and reducing longevity dramatically. HIRs do not suffer from these issues. The car that preceded my 2005 Dodge Magnum was a 2000 Toyota Camry V6. It was a great highway cruiser and I was sad to see it go, but only for about 30 seconds since I traded it for something much more fun. One of its most noteworthy features was a lighting system that -- even bone-stock -- was the best of any auto I have ever driven. Before that, I have made it a point to -- intelligently -- beef up the lighting output on other cars I have owned. By 'intelligently' I mean I bear in mind things like beam focus, lens cutoff and wiring, so I can see better but also do not blind oncoming drivers or melt things. The Camry was the first car I owned where I felt no need to augment the lights. When I picked up the Magnum and dropped off the Camry, it was at night. The first thing I noticed was the lighting system was, by comparison, pathetic. I felt downright unsafe with what looked to me like a dim glow in comparison to what I was used to. Couple that to the fact that very often I am driving in rural areas where I'm the only light source and a change had to be made. After a little research on the internet (too little), I purchased a pair of Silverstar low and high beams. Claims made by the manufacturer and users made them sound like just the ticket. Initially I was pleased. The whiter light seemed brighter, and I felt I had an easier time seeing what was in front of me. Over time I continued my research and started seeing more and more information covering the lighting issue in depth. Here is one widely respected source that should be considered required reading on the subject. It became clear that the reason the Silverstar and other tinted bulbs appear to be a better light had much to do with the perception of light and not as much to do with the amount of light (actual lumen output). I also found that the bulbs, for reasons too involved to go into here, burned out shockingly fast due to the nature of their construction (the manufacturer recommends you replace Silverstars annually). Neither point was particularly satisfying. HID alternatives were still reasonably young in the market at the time, and were both very expensive (at the time, a quality HID kit was several hundred dollars) and problematic with respect to the amount of light put out from a light housing designed to work with a halogen filament. I crossed them off as an option and concentrated on halogen-based solutions. That was in 2005. 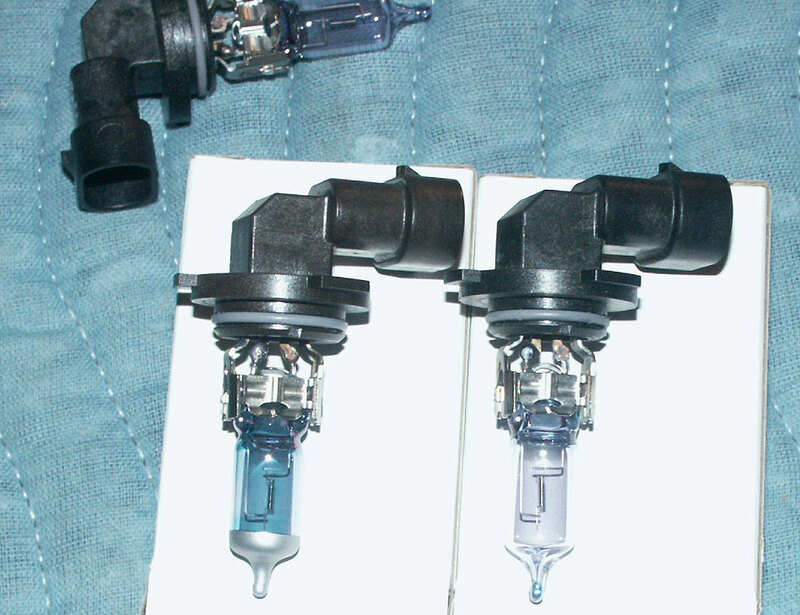 Now, in 2009, with the advent of low-cost, commoditized HID kits on EBay driving the price down to about $75 a set, an HID kit of reasonable quality can be had provided the buyer is willing to wire it up. Insofar as the LX platform is concerned, the strong cutoff of the light housing keeps the light output from bothering oncoming traffic. But back in 2005 I was looking only at halogen solutions. I eventually narrowed the field to one standout whose specifications for lumen output and longevity were nothing short of outstanding. The technology is known as Halogen Infra Red Reflecting, or HIR for short. HIR bulbs were originally developed and patented by General Electric. their plan was to provide most of the light output by an HID for a small fraction of the cost. 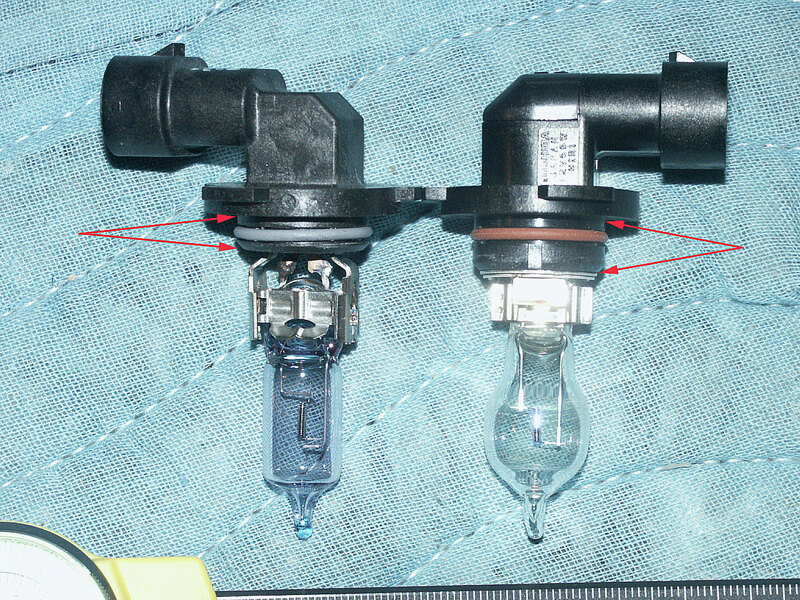 They are still sold by GE for home lighting applications, but early on GE dropped their automotive line due to issues with their bulb design (they broke easily in the automotive environment). The patent was licensed by Toshiba, who redesigned the bulb to a more robust configuration and has been quietly marketing them to automobile manufacturers, not the general public, ever since. Since they are typically sold to manufacturers, that means they aren't the easiest to find on the retail market. The site most often used is Max Lumens' site (yes, I know his real name and no, I'm not telling). Hundreds of LX owners that I am directly aware of have purchased from him without incident as of this writing. First and foremost, you need to do some minor trimming work on one of the three tabs on the bulb. Excellent instructions are located here. Once this is done, its time to figure out how to get that bulb in the light socket. On the LX platform, installation of an HIR bulb is a bit frustrating. In a nutshell, we don't have much room to work with. 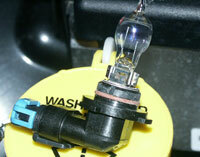 As the use of these bulbs has become more commonplace, better techniques have been discovered to get the job done. The problem is that someone with small hands can stuff their fingers down where they have to go, but applying the leverage necessary to twist-lock the bulb in place is difficult at best. For people like myself with large hands, the exercise is done entirely with the fingertips and well nigh impossible. Not totally impossible (I did it, eventually) but quite difficult. 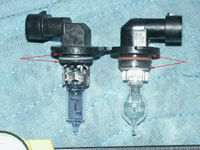 Originally, the solution was to file the barrels of the bulb housing down to loosen the fit of the bulb just a bit. This allowed the bulb to go in. During that time it was thought the barrels were oversized in the Dodge/Chrysler housings, but this was found not to be the case when someone thought to remove the headlight. Once that was done, and all leverage and hand-squeezing was removed from the picture, the bulbs fit in easily. Spend 10 minutes pulling each headlight so you can get to the bulb easily. One method that may or may not yield results but is certainly worth a try: apply some lubrication to the surfaces that will be going into the light housing. Perhaps some lip balm? Certainly whatever it is should not be flammable. I know of people who have done it with success, but if you decide to go this route you take the responsibility for whatever it is you decide to use. beware the phonies... There are, unfortunately, fakes out on the market. However they are quite easy to spot. This site has an excellent write-up on some you may come across. I've seen a few of these on EBay over the years. Even bona fide vendors who don't know the product can be taken in. Very recently I saw a vendor who purchased a large lot of the blue ones seen in the link above, genuinely thinking he was selling an HIR to his customers. When word got out what they were, a blizzard of cancelled orders, refunds and product returns ensued. Remember that the only genuine automotive product is the one patented, unique design pictured above.